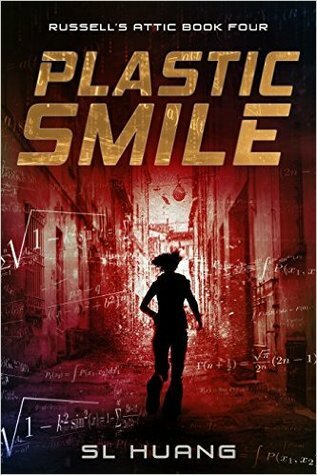 Plastic Smile is the fourth novel in the Russell’s Attic series, a usually action oriented science fiction series about an anti-heroic woman with superpowers based on math. I suggest reading the series in order, starting with the first book, Zero Sum Game. This review may contain spoilers for prior books. As part of her attempt to become a better person, Cas Russell has decided to fight crime. Being Cas, she decides to find the most mathematically efficient way of crime fighting. She hits upon a device that emits subsonic signals that break up group thought. Subliminal brain control over the entire Los Angles area. What could go wrong? At the same time, Cas finally agreed to let Checkers look into her background. However, it may be too late. The nightmares and flashes of memory have been building up to the point where Cas is barely able to function. She may be on the brink of a complete mental collapse. Compared to the other installments, Plastic Smile was not as fast paced or full or action. The pacing in general felt sort of wonky, since it didn’t follow the normal formula of Cas chasing after a defined bad guy and them trying to kill her. However, Plastic Smile more than made up for this by finally revealing answers about Cas’s background! This is something I’ve been wanting to know since book one, so I was so excited to have it here. Cas’s deteriorating mental state is a large part of the focus in Plastic Smile, and I really loved this plot line. I adore books where the protagonist is on the edge of a mental breakdown, so it should be no surprise that I liked this so much. Cas is a great protagonist, and one of the best antiheroines I’ve encountered in science fiction. In addition, I’ve really grown to like the supporting cast. A prickly loner finding friends is a character arc I’m sure to love. Russell’s Attic is the sort of series I turn to where I want something fun and snappy. It’s probably my favorite self published series, and I encourage everyone else to give it a try. I would love to see it get more attention.